Disciple making isn’t an individual sport – but a team sport. We must have teammates to learn from, to hold us accountable, to co-labor with, etc… Following Christ isn’t just about how I relate to God, it’s also about how I relate to other people. There is a corporate aspect of following Jesus. I don’t just become God’s child, I also gain many brothers and sisters. There are more than 50 passages in scripture that address ‘one another’ … such as, bear one another’s burdens, encourage one another and more. 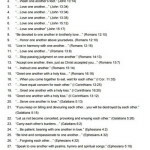 God designed us so that together we can help get the job done as well as to encourage one another on our spiritual walk. Today’s challenge is to read through the passages of scripture that mention ‘one another’ then reflect on how you can live out the Body in your own workplace, group(s) or church. Learn more in the video below by listening to Curtis share about Self-Feeding: The Body.